North Conway, NH – The kids are on vacation, and there’s no place better for on and off-snow events than Mt Washington Valley, NH. With 13 ski resorts and XC Centers offering seemingly endless skiing, plus a wide range of events, this is one perfect winter playground. Add in New Year’s Eve fun at restaurants and resorts throughout Mt Washington Valley, and this is one great vacation destination for Christmas Week. Here’s what’s in store throughout Mt Washington Valley for Christmas Week. December 22: Breakfast with Santa at the Sunrise Shack: Come meet Santa and make your last minute gift requests at The Sunrise Shack! Santa will be in town on the 22nd, and The Sunrise Shack has invited him and AbilityPLUS for breakfast. 10% of all breakfast sales benefits AbilityPLUS, so start your busy shopping day off right and help further adaptive sports programs in the MWV at the same time. Info: abilityplus.org. December 24: Christmas Eve Sleepover Fundraiser to benefit Harvest Hills Animal Shelter: Dedicated to not only giving our shelter dogs a night where they can feel a little Christmas Eve normalcy, but it is a fundraiser for special projects and programs at the shelter. This year, local veterinarian Dr. Steve Caffrey, AKA Uncle Steve, will be spending the night at the shelter! His mission was to create a warm and caring hospital with a high standard of care and personal service. Info and details: www.harvesthills.org. December 27-29: Penguins and Polar Bears Nordic Ski Camp at Great Glen Trails: This Nordic ski camp will focus on games and fun while teaching cross-country ski basics for kids ages six to eleven years old. Both Penguins (ages 6 to 8) and Polar Bears (ages 9 to 11) start off the camp with games that teach and test stopping abilities. The trails at Great Glen that wind through the meadows and forest will be explored. Ascending to the Great Angel Cabin, a log warming hut, is a significant ski goal for campers and is rewarded by a fast a turn-filled trip down the Dragon Corridor trail. Campers will also search for the locations of Trail Tracker critters. Of course, the camp wouldn’t be complete without a few runs on the classic tubing hill. Info at GreatGlenTrails.com. December 28: Torchlight Snow Tubing at King Pine: Experience the fun of lift-serviced torchlight night snowtubing down exciting snow chutes at the Pine Meadows Tubing Park, 5:30-9:00pm. Tickets are $19 per person during holiday periods for each 2-hour session. Tubes are provided by King Pine. One rider per tube. Info: KingPine.com. Dec 27-31: Cranapalooza at Cranmore Mountain Resort: On Saturday afternoons throughout Christmas Week periods, guests will enjoy a variety of fun family events throughout the resort in addition to snow tubing, mountain coaster, giant swing and soaring eagle zip line operations until 8pm. Plus, Cranmore is open for skiing until 8pm on Saturdays and vacation periods. The resort-wide, fun-filled après celebration is geared towards the whole family. You’ll find family entertainment, famous s’mores and DJ dance parties in Schneider Square with C-More the Penguin, face painting, family games and activities, giveaways and so much more. Adults can enjoy live music in Zip’s Pub and Grill then gather the family back together for an early fireworks show at 6pm on Dec 31. Info: Cranmore.com. December 29: Evening Snowshoe Tour at Great Glen Trails: Experience the wonder of a nighttime winter walk. Join a Naturalist from the Appalachian Mountain Club on a guided snowshoe tour. We will use our senses (and no flashlights) to navigate the trails while listening for owls calling and exploring our senses. Tours depart at 7:00 pm please plan to arrive by 6:30 pm if you need rentals. $12 per person over 12, free under 12. Minimum age is 8 years old, Info: GreatGlenTrails.com. December 26-31: Conway Scenic RR Holiday Week Trains. Old-fashioned train rides will be offered twice daily December 26 through 31, to Conway:11:30 and 1:30 (about an hour round-trip). December 26- 31 Old-fashioned train rides will be offered twice daily during Christmas Vacation Week, at 11:30 and 1:30. Conway Rates Coach First Class Premium (Dome) Adult $18.00 $22.50 $27 Child (4-12) $12.50 $17.00 $23 Under 4 Free $9.50 $14 Info and schedule: https://www.conwayscenic.com/blog/holiday-week-excursions/. December 31: Attitash After Dark: King Jeremy, An Authentic Pearl Jam Tribute Band at Ptarmigan Pub, Attitash: Ptarmigan Pub transformed for After Dark Concerts sponsored by Bud Lite. Music starts at 2pm with the Riley Parkhurst Band. Fireworks at 6:30pm. Dinner menu available, King Jeremy at 8pm: Info: Attitash.com. December 31: New Year’s Eve celebration at King Pine: Ring in the New Year with an evening of skiing, riding, music and fun – complete with torchlight parade and fireworks at King Pine. Night skiing ticket packages available, face painting, music and s’mores around the campfire, Torchlight Parade at 9pm followed by fireworks at 9:20pm. Info: KingPine.com. December 31: Partybrationn at Santa’s Village: Santa welcomes you to the 10th annual New Year’s Eve Partybration from 4pm to 9pm. The celebration begins a bit early for younger guests, with fireworks at 8pm. Ride on some of your favorite rides and enjoy some of your favorite Santa’s Village treats one last time this year. This all-inclusive (food and soft drinks, rides and festivities) party will feature a DJ who will take requests. Must purchase tickets online ahead. Info: https://www.santasvillage.com/park-info-tickets/seasons-and-events/new-years-eve-partybration/. December 31: New Year’s Eve Dinner at Max’s Restaurant and Pub: Reserve ahead for the special 6-course dinner from 5:30 to 9PM on New Year’s Eve at Max’s in Snowvillage Inn. Space is limited. Info: 603-447-2818. December 31: New Year’s Eve Dinner at Highfields, Eagle Mountain House, 5:30-9:00pm. Full special menu available. Info: here. December 31: Ring in the new year at Schouler Park: After enjoying a wonderful dinner at one of Mt Washington Valley’s restaurants, ring in the new year with fireworks in Schouler Park. Info: MtWashingtonValley.org. With so much happening in Mt Washington Valley, it’s time to get started planning your December getaway. Go to www.MtWashingtonValley.org for all the planning tools you need or call 800-367-3364 (800-DO-SEE-NH) to talk to a visitors services representative. To learn more about a vacation to New Hampshire, go to www.VisitNH.gov. 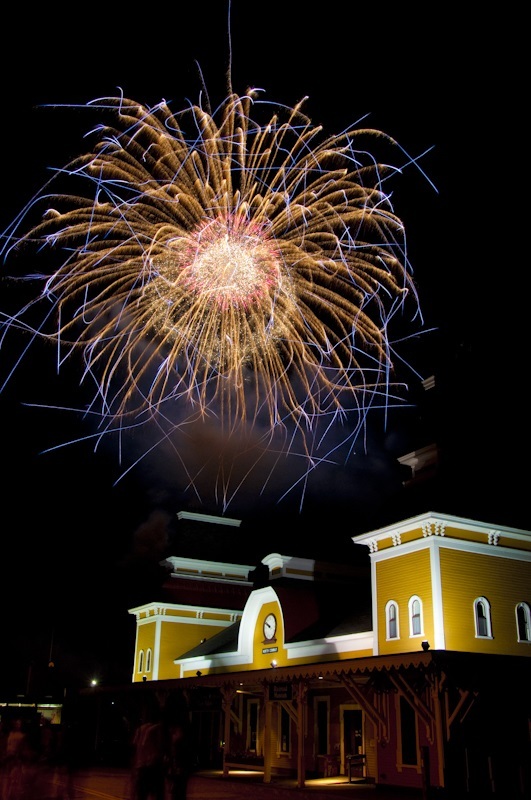 Photo: Fireworks over Conway Scenic RR. Credit: Karen Stancik. Contact Marti Mayne at PR for additional photos. There’s snow in our backyard, even if it’s not in yours!